All the extra stuff that enriches my crochet patterns and helps level the playing field for every crocheter: tips, tricks, designer secrets and advice. Any project info that you normally have to search out in different places is collected here. I'm a big fan of this way to crochet a "baktus"-style (wide, shallow triangular scarf) and other triangular wraps. 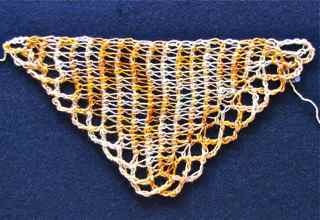 I'm writing this blog post for the crocheters who have never made a shawl this way and who may find it puzzling at first. The two published designs so far are Islander (Tunisian crochet) and Frostyflakes (regular crochet). When I get questions about these patterns, it's because the look of their set-up rows confuses crocheters, even if they're making them correctly. Crocheting point to point is a new experience. It seems to be a less common type of construction. All you have to do is expect your set-up rows to look unfamiliar, and before you know it, the choppy seas will turn calm and it will be smooth sailing. So smooth, in fact, that you'll pick up a lot of speed and keep thinking "just one more row!" Look closely at these next two photos. See the long straight side across the top? (In the red one it is the neck edge.) Now look at each end of this long straight side. These two corners of the triangle are the "points." You start at one point and finish at the other point. Imagine what the first few rows of these scarves might have looked like when I began them. 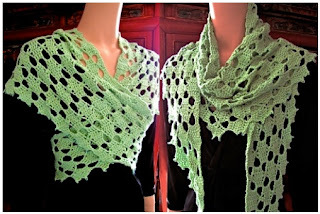 You can see why some crocheters could think they're doing something wrong. Swatch worked "point to point"
Point-to-point is a little different because you only increase along one side of the triangle. This can cause the first 5 rows or so to look odd, if you're used to traditional "corner-start" or "corner to corner". 2. 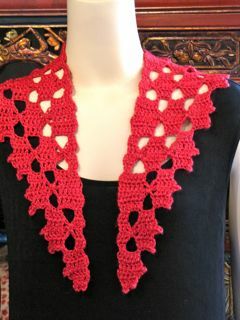 It's a new experience even for a crocheter who has made triangular wraps that start along the longest top edge, or grow outward from the center of the top edge, or start at the bottom center point. This is because another way to think of "Point-to-Point" construction is "Side-to-Side." 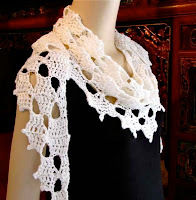 When you wear your finished point-to-point shawl, the rows will run vertically from its top (at your neck) to its bottom edge (near your waist or elbow). 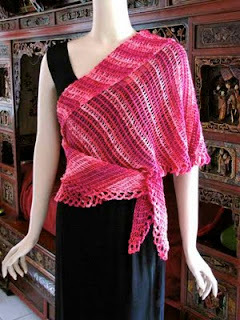 If one were to make a rectangular wrap from side to side, one might say it's worked "from one short edge to the other." A "side to side cardigan" means that the foundation row runs vertically along the button band, or along a side seam. The only difference between point-to-point and side-to-side is that with point-to-point you start with almost no foundation row, whereas with side-to-side you start with a longer, more familiar and recognizable foundation row. This is another reason that the first 5 rows or so can look odd, if you're not used to it. 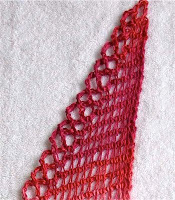 Crocheting point to point is actually easy because you're only ever increasing or decreasing along one edge of your shawl. The opposite edge is worked even. 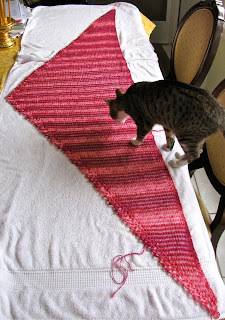 It's easiest of all with Tunisian crochet because you don't turn your work. 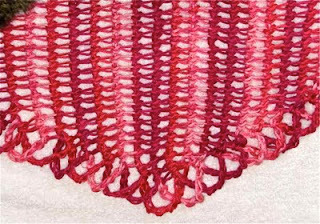 I prefer to do increases or decreases along the right edge of my Tunisian rows (the start of the Forward Passes) because Tunisian crochet is naturally suited to this. Crocheting point to point is fun because you can close your eyes and pick any yarn from your stash. You don't have to worry about running out of yarn, or finding a yarn with the right thickness. Then, set up your starting corner: these set up rows are also the shortest rows, so they work up quickly. Reward yourself with chocolate if it's your first time, and then you'll be on your way to crocheting at your peak speed. 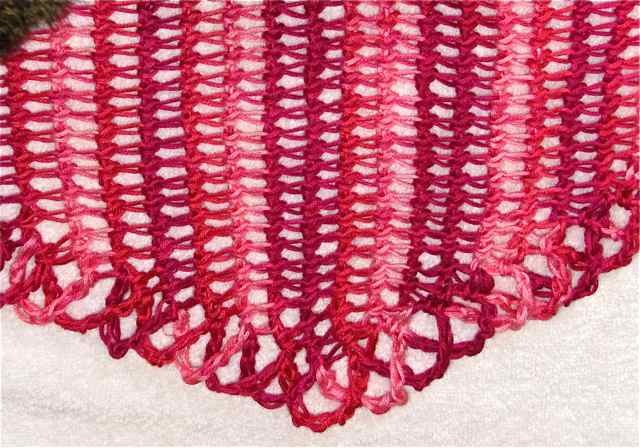 Once your starting corner is set up, it's usually easy to remember the stitch pattern; you can avoid reading the instructions for each row until you're ready to begin the decrease rows. from making increase rows to making decrease rows. When I design a new point-to-point shawl, I'm in complete control of how much yarn I'll need as I go--especially if I edge it as I go too. I simply start decreasing when I've use half of the yarn I wish to, or when the center row is the length I like for the deepest center point of the triangle. withlong points tied at the back waist. Crocheting point to point is versatile. If you wish to try designing your own, it's a great way to create a wide, shallow triangle, which often has a more modern or updated look, and is more flattering on some folks. A bonus of such an oblique angle is that the two points are elongated and skinny and can easily be used as ties (such as for a sarong or head scarf). I found about seven different ways to wear the Islander Wrap because of this feature! 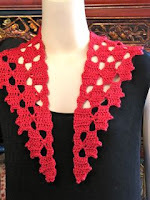 Click logo to see all crochet designs by Vashti Braha. 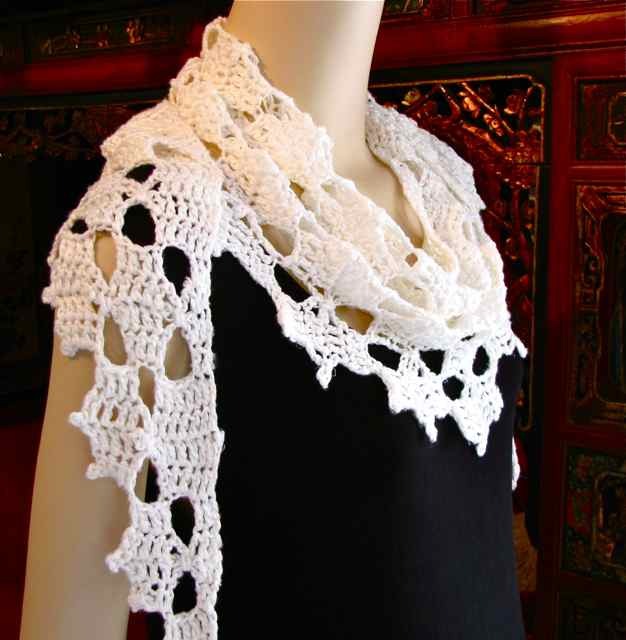 It's also the exclusive source for new downloadable patterns by my pal Doris Chan! 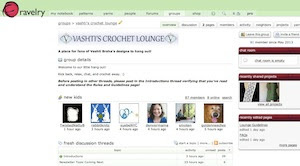 Click the image to visit Vashti's Crochet Lounge in Ravelry. Visit Vashti Braha's profile on Pinterest. Which Foundation Stitch? and Why? © Vashti Braha 2010-present. All Rights Reserved. Ethereal theme. Powered by Blogger.